All companies in the UK with over 250 employees will soon have to publish their stats on gender pay differences. The campaign has been launched by Labour's Stella Creasy. A NEW CAMPAIGN aiming to hold companies to account and address the gender pay gap has been launched by MPs in the UK. The #PayMeToo initiative c0mes as new laws in the UK are set to see all private companies with more than 250 employees compelled to reveal the difference in hourly rate paid to men and women before midnight on Wednesday 4 April. 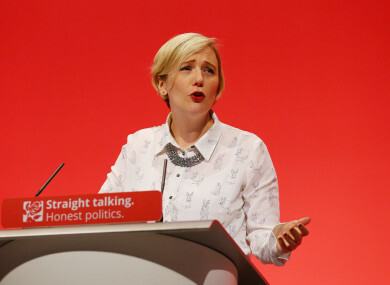 Labour MP Stella Creasy is leading the charge with the campaign, which offers women advice on how to tackle the gender pay gap where they work. Efforts are also under way in Ireland to address this issue, with EU figures showing that women currently earn around 13.9% less than men. In the UK, that figure is 19.5%. Although the idea of implementing compulsory reporting of the gender pay gap in larger companies has been mooted here, we have not followed suit with the UK on this matter as of yet. On Friday’s The Late Late Show on RTÉ 1, former Six One news presenter Bryan Dobson said that he “found it difficult” to see any justification for his co-host Sharon Ní Bheoláin. It was revealed last year that Dobson earned between €60,000 – €80,000 more than Ní Bheoláin a year. The issue continues to make headlines in the UK too, with former Tennis star Martina Navratilova claiming that the BBC pays fellow former pro John McEnroe “10 times more” than her for punditry work during Wimbledon. In launching the #PayMeToo campaign, Creasy told the Guardian it was important to not only know which companies pay women less than men, but to follow up with them to see what changes are being made. The Walthamstow MP urged women in the UK to complete and share the #PayMeToo survey so that policy on the issue can more well informed. “Women are already telling us that they are being told not ask difficult question about this for fear of affecting their careers and we want to be clear that trying to silence employees isn’t the right response,” Creasy said. Every woman has her own story of experiencing pay discrimination in their careers including me – now they need to know they have MPs ready t0 listen to them and act. She added that senior managers in companies where a gender pay gap exists should be expected to take steps to try to address it. Email “UK female MPs launch #PayMeToo campaign over gender pay gap”. Feedback on “UK female MPs launch #PayMeToo campaign over gender pay gap”.